Officer Nicholas Discuillo, right, was promoted to lance corporal by Dagsboro Police Chief William Toomey on Monday, Jan. 28. At the Monday, Jan. 28, Dagsboro Town Council meeting, Police Chief William J. Toomey made a special presentation and promotion for officer Nicholas Discuillo. Discuillo was awarded with the Expert Officer Cord from Toomey, which Toomey said was merited due to Discuillo’s meticulous and impartial enforcement of the law during the time period of February 2018 to January 2019. His efforts led to an overall performance exceeding 1,000 criminal and traffic arrests, with a conviction rate greater than 85 percent. Toomey also promoted Discuillo from patrolman first class (PFC) to lance corporal (LCpl. ), effective Feb. 1. Discuillo said the promotion was not solely his honor. 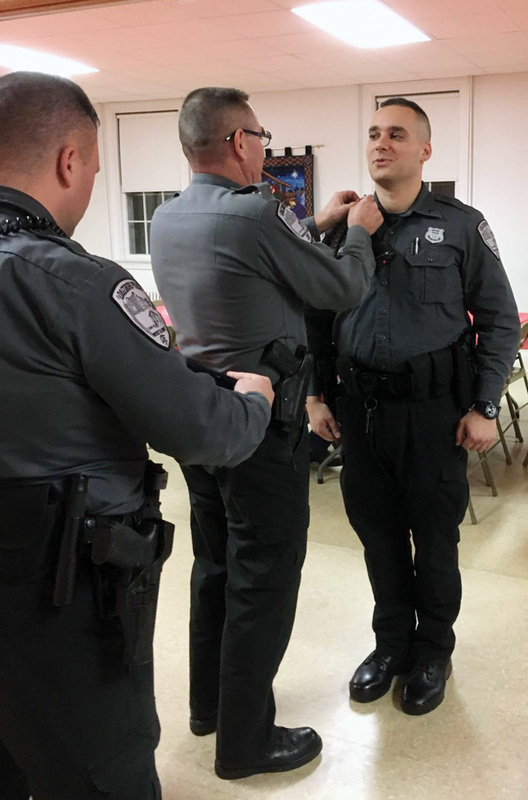 Discuillo joined the Dagsboro Police Department in February 2018, which brought the department to full staffing levels. He had come to Dagsboro after serving three years with the nearby Milton Police Department. • During the course of the month of December, the department apprehended 22 wanted subjects for local jurisdictions and the courts. The officers made a total of 27 criminal arrests that included among them arrests for terroristic threating and resisting arrest, and three separate drug arrests. There were a total of 148 traffic arrests made by the DPD in December and seven collisions investigated. • For the 2018 calendar year, there were 2,083 total traffic arrests and 210 total criminal arrests by the DPD. Among the notable criminal and traffic arrest figures, drug-related offenses topped the list with 45. There were 18 DUI arrests, and a combined 15 arrests for theft and shoplifting among the other arrests reported. The department also investigated 95 collisions in the town. • Toomey discussed the collective work of the department for the entire 2018 year. There were 108 wanted subjects apprehended for local jurisdictions and the courts. • Toomey made special mention of three events that the department had participation in, which included the town’s first annual National Night Out. He thanked the community for its support in being able to celebrate National Thank a Police Office Day again in 2018. • He also presented a statistical comparison for the department’s activity from 2006 through 2018. Traffic arrests were up from the year prior, from 1,565 to 2,083. That was the highest number since 2014, when there were 2,415. Traffic warnings dropped significantly (272 to 69), while criminal arrests (302 to 210) and traffic collisions also went down (97 to 95). Criminal complaints went up from 767 to 797.